Dell made a splash at the 2017 SXSW festival, hosting an interactive 4-day pop-up called “The Experience” which allowed visitors to explore the latest Dell innovations, including virtual reality, security, open source, entrepreneurship, and creativity. Attendees interacted with cutting-edge technology related to music, video, and gaming, and listened to thought-provoking sessions like “How VR Could Change the Way We Do Everything,” “You’re Secure but Is Your Workplace?” and “What It Means to Build an Open Source Culture.” But the real treat for small business owners was the ability to connect with Dell representatives to learn how technology can help them grow. At The Experience, I caught up with Erik Day, Vice President & GM, North America Small Business at Dell Technologies. He spoke about the excitement of being able to connect with customers at SXSW and the fact that Dell is much more than just products. “The great thing about Dell is that we really are an end-to-end solution provider for customers." As always, you can access the full interview by clicking Play below. At Dell, they understand that technology isn’t what keeps you up at night as you focus on getting the next customer and creating the next product. Their team is ready to answer ANY technology questions you might have. The cloud is a big buzz word right now, although some may not even know what it is. That’s okay! Not only can they answer your questions (see point #1), they can help you with everything you need to create a cloud computing environment and explain what it means to the future of your business. The backbone of your company is your customer base. Keeping your customer data protected is a vital part of business growth. Dell works with customers to provide financing and lines of credit so your technology needs are covered, and your capital can go to finding the next customer, product, or innovation. 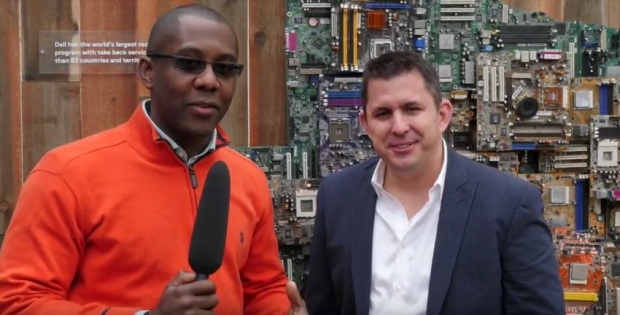 To learn more about Erik, Dell, and The Experience, watch the video above…and stay tuned for more SXSW coverage in the days and weeks to come.